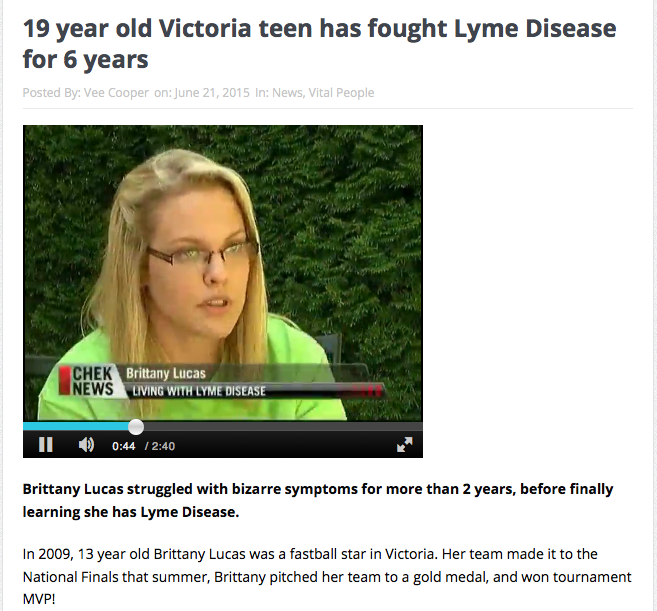 Strike Out Lyme – Hockey helps me fight Lyme Disease! At the game with my family! Chances are you know someone like me who has Lyme disease, the fastest growing infectious disease in North America. I’ve gotten through the hard times by leaning on my faith, family, and hockey. As a teenager, watching my friends live life while I was stuck in my bedroom wasn’t easy. Being part of the hockey community gives me something to feel a part of and look forward to. The players were my inspiration, my best friends and a distraction from the pain. A life-long athlete, I was 14 when I went from being a carefree, gifted student and athlete, to depending on a wheelchair. I dreamt of playing fastball in the Olympics for Team Canada. Struggling against adversity is what defines an athlete, and my training has been my greatest asset in my 5 year battle with this disease. I’ve had to push my body to limits it shouldn’t have to reach. One day I was fighting fatigue while pitching multiple games daily, and the next struggling to just catch my breath and crawl out of bed. I’m 20, and Lyme Disease stole my dream, and health. Lack of knowledge by Canadian doctors forced my family to seek on-going treatment in Los Angeles, at tremendous personal expense. Although my health is improving, I continue to struggle with daily life, and hockey helps me through it! Far too many people are losing their own battles against this disease. It’s time for change! Two gifted athletic friends of mine, Daniel Corso and Tanner Cookson, recently rode their bikes across Canada to raise awareness and funds for Lyme Disease in honour of their friend Adelaine. During their 57-day long journey they dedicated each day to someone battling Lyme Disease. It was heartbreaking reading those stories and realizing how many people across the country are suffering. There are far too many of us who have to fight this disease alone, but Daniel and Tanner’s project has spread hope across the country and given everyone the feeling they are not alone. The ‘Ride for Lyme’ inspired me to share my story, in hopes of encouraging you to donate generously, raise awareness and join the team as we try to Strike Out Lyme. Please assist me in scoring my goal of Striking Out Lyme by clicking on the donate button and donating to Ride for Lyme – The Adelaine Project. You’ve been my inspiration, so I hope this inspires you to bring Lyme into the Lymelight. If you’d like to read more about journey, please check out “My Story“. Thanks to Sue Ferguson of Outer Limits Digital Photography for this amazing photo.